Fun to make and to wear! This scarf comes off your loom in a zig zag shape, almost like magic, and is a real eye catcher. The sample pictured is made using Caron Jewel Box yarn in color "Amethyst". 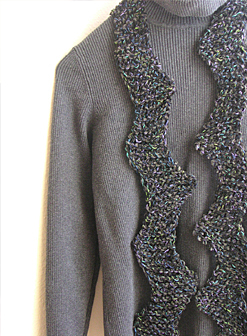 This pattern is written using 15 pegs, however instructions are given for adjusting the scarf to any desired width. Stitch Techniques: E-wrap, purl, increasing, decreasing, working as a flat panel, and flat panel bind off.